Tuesday 17 January 1911, page 9. "I have heard of surf shooting in Sydney," says "W.T.M." (Williamstown), "and, as I am spending some time at Sorrento, would like to know how to practise it. Can you give me any hints." You need to begin in shallows where you can stand on the bottom and get the benefit of a jump off with the wave. Of beginners 99 per cent start too late. You need to jump off just before the white wave crest appears on the wave which is breaking behind you. You can only find the right moment by contiuous practice. When you have judged it correctly in the shallows go out to deeper water. Take the wave at the same time, making one sweep with your right arm and one kick of the left leg, the left arm being down along the side. After tjhe first strong stroke the right arm, like the left lies along the side, the legs straight back. It is altogether a matter of timing and balance, which you can learn with long practice. In Sydney they say it takes two years' practice to make a good surf-shooter. While use of surf boards is forbidden in Sydney, but where there are not so many people bathing you can do so fine shooting with it. The board - as light as you an get it -should be 2ft or slightly under in length, and not more than 18in. in width. Time the wave as already as suggested. The board is gripped in the centre at each end, the further edge inclining upward from the water at an angle of less than 45 degrees. It is held at arms length. Try it only where there are not many people bathing together at one time. Honolulu, January 30, 1911, page 6. The Outrigger Club Is making a great bid for public favor this year, according to the plans discussed at the first meeting of tne new directors on Saturday afternoon. An effort is to be made to increase the interest at present taken in surf-boarding, canoeing and swimming, and special energy will be directed to getting the younger members of the community interested in the sport. In order to put the ideas of the new directorate into effect as soon as possible a committee consisting of Allan Herbert, Theodore Cooper, A. H. Ford, Edmund Melanphy and Irwin Spalding was elected to draw up the plans for the desired competitions, and to work up general interest. Several much needed additions are to be made to the clubhouse, including a new bathhouse, in which showers will be installed. The present directorate is nothing if not enthusiastic, and their enthusiasm bids fair to bring the Outrigger Club into the front rank as an institution to which all swimmers should belong. After the success attained by the swimming meet held at Fort Shatter on Friday evening, it will not be suprising if swimming Ikhmm here during the coming summer. The Outrigger Club will probably be able to enter a team in the next meet, and this in itself will add additional interest to any aquatic function held here. The more competitive clubs there are the better for sport generally. Sydney, 2 February 1911, page 3. The annual carnival of the Bondi Surf Bathers' Life-Saving Club has been fixed for February 25, when an excellent programme has been arranged. Besides the ordinary life-saving competitions there are many novel and interesting items which have never been seen before at these aquatic carnivals. One feature will be the "shooting" the waves on the long Honolulan surf boards. Friday 10 March 1911, page 3. Surf-bathing as a sport is, without doubt, one of our most popular diversions, and notwithstanding the fact that it is attended with an element of risk, as is evidenced by the recent calamity at Coogee, it is safe to say that it has come to stay. Many of our regular surf-bathers have become highly expert in shooting the breakers, and their exploits in that fascinating pastime are at once the envy and the admiration of the novice. But, after all, we are only children at the game. Centuries ago the natives of Hawaii had attained a pitch of perfection at the art of surf riding which would leave our best exponents far in the rear, and the bronze skinned Hawaiian of to-day is just as expert as his ancestors. There, however, the surf-board is in vogue, and almost incredible feats are performed by the expert riders. It is quite a common thing for the surfer, standing on his board before the crest of a roller, to be carried over half a mile at Waikiki Beach, near Honolulu; while after a stormn, the rider can start his trip over a mile out to sea and be landed right up on the beach. (Image) SURF-BATHING, NEW SOUTH WALES. said to be even more wonderful feats performed. To stand on these frail boards and guide them with the feet is itself an accomplishment requiring skill, nerve, and constant practice; but the Hawaiian riders leap from one board to another at full speed, climb on each other's shoulders; and perform other remarkable feats. The natives have, however, a serious rival in the white man, who is becoming almost as expert on the surf-board. A most interesting account of this sport, by one of the Honolulu experts, appears in a new magazine entitled the Mid-Pacific. This periodical, which is splendidly got up, is published in Honolulu, one of its main objects being to promote tourist traffic across the Pacific, and to boom Honolulu, and other countries such as New Zealand and Australia, which would be included in the tourist's itinerary. This is with out doubt a matter of great importance to the countries concerned, and the Commonwealth Government has shown its appreciation of the scheme by delegating Mr. Percy Hunter, the Director of the New South Wales Immigration and Tourist Bureau, to represent it at a Pan-Pacific Congress, which is to be held at Honolulu this month. The Mid Pacific, if it obtains the circulation its promoters anticipate, should do a great deal to arouse interest in travel on this side of the world. There are two kinds of boards for surf-riding. One is called the olo, and the other the a-la-la, known also as omio. The olo was made of wiiiwill- a very light, buoyant wood- some 3 fathoms long, 2 or 3 feet wide, and from 6 to 8 inches thick along the mlddle of ,the board, lengthwise, but rounding toward the edges on both upper and lower sides. It is well known, that the olo was only for the use of the chiefs; none of the common people used it. They used the a-la-ia, which was made of koa, or ulu. Its length and width was similar to the olo, except in thickness, it being but of 1 to 2 inches thick along Its centre. The line of breakers is the place where the surf rises and breaks at deep sea. This is called the kulana nalu. Any place nearer or closer in, where the surf rises and breaks again, as it sometimes does, is called the ahua, known also as kipapa or puao. There are only two kinds of surfing in which riding is indulged; these are called Kakala, known also as lauloa or long surf, and the ohu, sometimes called opuu. The former is a surf that rises, covering the whole distance from one end of the beach to the other. This, at times, forms in successive waves that roll in with high, threatening crest, finally falling over bodily. The first of a series of surf waves usually partakes of this character, and is never taken by a rider, as will be mentioned later. The ohu is a very small comber that rises up without breaking, but of such strength that it sends the board on speedily. This is considered the best, being low and smooth, and the riding thereon easy and pleasant, and is therefore preferred by ordinary surf-riders. The lower portion of the breaker is called honun, or foundation, and the portion near a cresting wave is termed the muku side, while the distant, or clear side, as some have expressed it, is known as the lala. During calmn weather, when there was no surf, there were two ways of mIaking or coaxing it practised by the ancient Hawaiians, the generally adopted method being for a swimming party to take several strands of the sea coavolvulus vine, and, swinging it around the head, lash it down unitedly upon the water until the desired result was obtained. The swimmer, taking position at the line of breakers, waits for the proper surf. As before mentioned, the first one Is allowed to pass by. It is never ridden, because its front is rough. If the second comber is seen to be a good one it is sometimes taken, but usually the third or fourth is the best, both from the regularity of its breaking and the foam-calmed surface of the sea through the travel of its predecessors. In riding with the olo or thick board, the board is pointed landward, and the rider, mounting it, paddles with his hands and impels with his feet to give the board a forward movement, and when it receives the momentum of the surf, and begins to rush downward, the skilled rider will guide his course straight, or obliquely, apparently at will, according to the spending character of the surf ridden, to land himself high and dry on the beach, or dismount on nearing it, as he may elect. This style of riding was called kipapa. In using the olo great care had to be exercised in its management, lest from the height of the wave- if coming in direct - the board would be forced into the base of the breaker, instead of floating lightly and riding on the surface of the water, in which case, the wave-force being spent, the reaction throws both rider and board into the air. In the use of the olo the rider had to swim around the line of surf to obtain position, or be conveyed thither by canoe. To swim out through the surf with such a buoyant bulk was not possible, though it was sometimes done with the thin boards, the a-la-ia. These latter are good for riding all kinds of surf, and are much easier to handle than the olo. Kaha nalu is the term used for surf swimming without the use of the board, and was done with the body only. The swimmer, as with a board, would go out for the position, and, watching his opportunity, would strike out with hands and feet, to obtain headway, as the approaching comber, with its breaking crest, would catch him, and with his rapid swimming powers bear him onward with swift momentum, the body being submerged in the foam, the head and shoulders only being seen. Kalha experts could ride on the lala, or top of the surf, as if riding with a board. Duke Kahanamoku: Riding the Surfboard, Part 1. Mid-Pacific Magazine, Volume 1 Number 1, January 1911. "Conducted by Alexander Hume Ford"
Duke Kahanamoku: Riding the Surfboard, Part 2. Mid-Pacific Magazine, Volume 1 Number 2, February 1911. The text, largely reproduced from Thrum's Hawaiian Surfriding (1886), is discussing ancient surfriding, and not contemporary practice. Percy Hunter : July Skiing in Australia. Extracts from The Mid Pacific Magazine, January, 1911. Hawaiian people, riding the surfboard. The board itself is from 6 to 10 feet long- and somewhat pointed at the ends. On these you paddle out all the way from half a mile to a mile, where the first big rollers begin, and after getting started in front of one it will carry you at express train speed until you reach the beach. The water was the finest I was ever in, but our time was short and, after a few minutes of pleasure, we reluctantly tramped back to the bathhouse and were,soon again spinning over the lovely roads for which Honolulu is famous, back to the ship. Friday 24 March 1911, page 10. The customary procedure in the surf at Manly when a channel is formed is for men to be continually rescuing ladies from the dangerous water. This, however, was reversed about 9.30 o'clock yesterday morning, when Miss Ivy Schilling, the well-known dancer of "Our Miss Gibbs" Company, saved Mr. Tom Walker, one of the most skilful surfers who frequent the South Steyne beach. Walker had been shooting the breakers for some time, when a wave carried him into deep water. He states that he then was seized with violent cramp in the stomach, and threw up his hands. Jack Reynolds, the Manly life-saver, was basking on the beach, not being on duty; and he took no notice of Walker going under for the simple reason that he knew him to be a strong swimmer. Walker said he realised this would likely occur, and felt his position to be all the more desperate on that account. Just as he was faced with this ordeal he noticed someone swimming strongly towards him. He was taken hold of, and assisted into shallow water. By this time "Happy" Eyre, the relieving beach attendant, had dashed in to his assistance. Both were surprised to see that Walker's rescuer was a girl. She had handled the emergency coolly and expertly, and there was considerable enthusiasm when she helped the beach attendant drag Walker out of the water. After working on the young man for some minutes he recovered. Walker attributes his trouble to going into the water too soon after breakfast. Melbourne, 30 March 1911, page 37.
bathing suit, and they make picturesque figures, while scenes of Sydney's surfing resorts with their crowds splashing in mighty billows, which break into a white fringe on the shore, form an admirable introduction. West's Pictures are indeed to be congratulated on the excellence of the series. Music and wonderful photo plays make up a most enjoyable programme at the Lyric Theatre, Prahran. This week a perfect sensation is being caused by the acting of the famous Paris tragedian, Georges Wagne, as Tallien in "Madame Tallien," a drama of the terrible Revolution in France. His work is truly wonderful; the man's whole being seems to vibrate with the intensity of his terrible passion. The play is a most gorgeous production in colour, the dresses of the Versailles being perfectly beautiful. There is also a fine travel study of the daring surf-riders of Hawaii, who slide into shore on their fiashboards over the crests of the Pacific rollers from distances of a mile out. The programme is most varied, and Signor Briglia has excelled himself in the splendid list of music he has put forward this week. The crowded houses in this pretty theatre are not to be wondered at. Monday 3 April 1911, page 13. The fourth annual carnival of the Manly Surf Club was held on Saturday jn delightful weather. Crowds flocked to the beach to witness the entertainments and displays by the various clubs and the numerous water champions. The Manly and Port Jackson Steamship Company had a frequent service of boats, and at times the Corso and the beach were one mass of moving humanity. At the rendezvous at the southern end of the beach good order prevailed, a barricade having been erected to give the competítors sufficient freedom to carry on the displays. This year's carnival was conducted without the usual fancy dress proccession from the wharf. On the beach, however, the spectators were well catered for, the proceedings opening with a grand parade of all the surf clubs, with their life saving appiaratus and appliances. The teams dressed in costume marched past in excellent order and received an ovation from the crowd. A feature of the day's entertainment was the magnificent surf-shooting; by the clubs. Individual surf-shooting on boards was also indulged in and the Hawaiian troupe of board shooters, gave exhibition which was loudly applauded. The lifesaving boat was not available but a small canoe steered by Mr Fred Notting, of Manly, made many successfuul shoots through the breakers. A team from the members of the Manly Ladíes Life-savng Club gave a capital exhibition of the work of lifesaving. An unusual and novel event was arranged for the termination of this year's carnival. Manly showed the vast gathering the tactics likely to he displayed by an invasion of the "Yellow Peril." Port Darwin was selected as the scene and a large army of "Brown Boys" made elaborate preparation to have a successful display. The Chinese had overthrown the marine defenders by cunning and deceitful methods, but were subsequently met face to face with a large army of the hardy surf club members, reinforced by a troup of boy scouts, who played great havoc with the invaders. The noise and din of the throng were sufficient to expel any enemy without firing a shot. Cannons roared, however, and the spectators were worked up to a great pitch of excitement. The Manly Council had given the club permission to take up a collection and a nice sum was annexed during the day. Fancy Dress Three legged Race: Nicholls Brothers (North Steyne), 1; Watson and Munro (Manly Surf Club), 2; Cavill and Healy, 3. The costumes worn were many and varied in the fancy dress parade, the winner being disguised as "Blue Bottle King, I. Curnow was successful for first place; Roy Lawrence (for Harem skirt), second; A. Watson (Chinaman) for most original. North Steyne secured the verdict for the grand parade, with Port Kembla second. Rescue and Resuscitation Competition: North Steyne, 54.1 points, 1; Manly No. 1, 51.3 points; Manly No. 2, 36.3 points, 3. Other teams competing were Port Kembla, Coogee and Freshwater. Surf Race: J. Grieve (Bondi), 1; J. Lord (Bondi), 2. Alarm Reel Race: Coogee 2m 14s, 1; North Steyne No. 1 2m 17s, 2. Pillow Fight: F. Knight (Little Coogee), 1; H. Davis (North Steyne), 2. Monday 10 April 1911, page 13. The annual carnival of the Freshwater Surf and Life-saving Club was held on Saturday afternoon in glorious weather. Frewshwater beach ranks as the premier surf bathing beach in the State, and it was not surprising to see such a large crowd present to witness the various displays. The feature of the Freshwater carnival is the fancy dress procession from the Manly pier to the beach, a distance of nearly two miles. Close on 50 members, attired in all varieties of costumes, formed the procession and a huge crowd escorted them through the Corso and along the ocean beach at North Steyne to the rendovous. Thousands had congregated on the various points of vantage, and the scene on the heights of Queenscliff overlooking the beach was very picturesque. A large committee controlled the arrangements but the bulk of the work was entrusted to the hon. secretary, Mr W. R. Waddington. The carnival was the most successful yet held by the club. A feature of the day's events was the fine surf-shooting by the Misses Lewers of Queenscliff. The Manly Surf Club's boat was in evidence, and several successful trials through the breakers were made. Mr. Fred Notting again contributed to the programme by venturing through the surf in his frail canoe, "The Big Risk." North Steyne suffered defeat at the hands of the Manly Surf Club team No 2. This is the first time the black and gold has been defeated for some years. Dusting the Beltman - Wyman (Stockton), 1; Moxon (Little Coogee), 2. Rescue and Rescuscitation competition - Manly No. 2., 1; Manly No. 1., 2; Bondi Surf Club, 3. Apple Race - Levi (Freshwater), 1; Wyman (Stockton), 2. Obstacle Race - Moxon (Little Coogee), 1; Fraser (Freshwater), 2. Alarm Reel Race - Manly No. 3, 1; North Steyne, 2. Pushball Match - Manly, 1. Pillow Fight - Knight (Little Coogee), 1; Mane (Freshwater), 2. Climbing Greasy Pole - Knight (Little Coogee), 1; Mason (Freshwater), 2. Sydney, Saturday 15 April 1911, page 10. A surf-shoot two miles long; is one of the attractions Hawaii has to offer, according to Mr. Ernest Kaai, musical director of the band of Royal Hawaiians, who are now giving concert entertainments in Sydney. Mr. Kaai does not look like a musical director. He does not wear his hair long, nor is he plagued with a temperament which causes him to burst out Into violent fits of temper bordering upon hysteria. Rather, he looks like a successful heavyweight pugilist, or an international Rugby forward. Mr. Kaai weighs 2971b., is 46in. round the chest (normal measurement), and he has a 17 in. calf. Mr. Kaai's speciality outside of music is surf-board shooting. He can stand on his head on a board which comes in ahead of a wave at express-train speed. But he explains that that is not the hardest thing to do in regard to surf-shooting. The limit, according to him is standing on the board with your back to the beach. A parallel is found in a driver of a spring cart looking over the tailboard, instead of at the horse, while the vehicle is in motion. Only the trick on the board Is harder. Mr. Kaai is going to give an exhibition on one of the Sydney beaches before he leaves Sydney, and it should prove of interest, for the reason that while local swimmers surf shoot in a fashion that arouses admiration wherever it is seen, they know nothing of board shooting. Mr. Kaai is of opinion that an expert swimmer can stand on a board inside three months if it is practised daily. Sydney, Monday 17 April 1911, page 9. The Hawaiians now in Sydney on a concert tour belong to an essentially musical race. While the typical Australian is sometimes represented by his detractors as one who would sooner lean up against a post as do anything else, the Hawaiian is happy when he has his beloved ukulele in his hand, and is lifting up his voice in song. The ukulele is a comparatively modern invention- or, rather, it is an improvement upon the ukeke, an instrument of the mandolin class of two strings only, and with no set tuning to it. The music was extracted by strumming with a straw. But the ukulele has four strings and covers every known chord in music. The Hawaiians sing when they are glad, and also in times of sorrow. They sing even when they are coming in hand in hand on a surf-board propelled by a wave breaking upon Waikiki Beacb. Mr. Kaai, the musical director of the company, describes the surf songs as short but full of life. Melbourne, 20 April 1911, p. 25. Mr. Kaai, the leader of the Royal Hawaiians, is a noted surf rider of Honolulu. In surf riding the swimmer pushes a board out through the breakers, then lies upon it facing the shore, selecting a suitable wave. He paddles furiously to gain speed until overtaken by the wave, and when fairly going stands upon the frail board till landed on the shore. No doubt Mr. Kaai will give exhibitions of his skill while he is in Melbourne. Mr. Thomas Kata (who possesses a very fine tenor voice) is another noted Hawaiian surf rider and has many interesting photos of himself pursuing this exhilarating sport. Honolulu, May 16, 1911, page 9. Josh Tucker was sitting on the lid of the land department this morning, and judging from his activity the lid was hot. He stated that in a short time the Hauula homesteaders will receive the 99 years homestead leases for which they have been waiting so long and anxiously. There are between twenty and thirty of these homesteads and the majority of the homesteaders long ago fulfilled the conditions required during the six years' probationary period, at the expiration of which they were told to come to town and get their papers. They have been coming to town ever since, on foot, horseback and in pake vegetables wagons, and now, probably because of their importunity, they are going to get their papers. These homesteads are mostly held by old natives whose forbears received the land from Kamehameha and whose descendants have lived on it ever since. They live a simple, quiet and happy life, fishing when the weather permits and living on their pigs, poultry and garden truck when the elements are unfavorable to the pursuit of the succulent crayfish and the elusive squid. And bathing suits have "riz,"
As of old in Waikiki. And joining in the lark. "Come in, the water's fine,"
There are a few places in the islands offering such inducements to the brainweary man or woman equal to Haleiwa. The white sand beach for bathers, the golf links and the tennis courts contribute to the enjoyment of guests at this famous hotel. This is a good time to consider where the vacation will be spent, and a good time to decide on Haleiwa. 16 May 1911, page 2.
one, and well up to the high standard of Hayes' Pictures. ... and "Surf Riding Sports in Hawaii" were pictures of great interest. The latter showed the natives of Hawaii riding the breakers on flat boards shaped like a coffin lid, all seeming quite at home on their novel craft. Honolulu, May 30, 1911, page 6. That was the only standoff recorded, the Public Service Association having insisted on cash down and a deposit for the mattresses before allowing anyone on the ship. Ford distributed Mid-Pacific Magazines and red capsules as counterirritants to insomnia, the idea being that the literature would cause the brain to spin in a contrary direction to that of the Molokai channel and while the gray matter hesitated whether to go starboard or port the capsule could get in its work. The magazine this morning had a wide circulation up and down the windward side of Maui and several dead sharks have been thrown up by the waves. The excursionists waved their last alohas just outside the sewer outfall at six-fifteen. Signals of distress were run up as the rounded Diamond Head and a wireless explained that Ford was insisting that everyone sleep with his head toward the engine. Aboard the Likelike seven-fifteen- Ford has threatened to put Captain Naopala in irons. Captain insists on ringing the ships bell overy thirty minutes. Ford says his excursion is no funeral and the tolling has to quit. Aboard the Likelike seven-twenty-two- Ford has just finished organizing the Salt Sea and Open Air Athletic Organization with himself as president. Says the December number of the Mid-Pacific to go to press this week will have a special illustrated story on the organization from a noted writer Alexander F. Hume. Is now canvassing for subscriptions. Aboard the Likelike seven-thirty-eight- capsules are running short. Offers if all else fails to return on a surf board for a fresh supply of capsules and more magazines. Aboard the Likelike eight-twelve- Crossing the Equator Club is formed with Ford as the Grand Equinox. He says the equator is an imaginary line and may just as well be imagined here as anywhere else. Announces a magazine story entitled "Lines I Have Crossed," by that eminent writer H. F. Alexander. Aboard the Likelike eight-eighteen- The engines have skipped two beats. Ford appointed a committee to watch the deck and has gone below to investigate. Aboard the Likelike eight-thirty-two- Ford is still bellow. A search party is being organized. Aboard the Likelike eight-forty- Search party reports back. Ford is safe but three of the engine crew were overcome by the hot air in the stokehold. Ford had to suspend argument in favor of a Stokers' Branch of the Hands-Across-the-Counter Club until the firemen came to. (Special Wireless) Alexander Hume Ford to H. P. Wood- Everybody's happy in Hawaii. Cable Taft that I will get in and help to carry reciprocity and arbitration provided Percy Hunter agrees to put Australia in the game. Get Joe Cooke to advance cable charges. Will organize the Anglo-Saxon Get Together Club on return. Aboard the Likelike nine-fifteen- Ford announces that he is turning in. Sydney, Thursday 15 June 1911, p. 10. Young Rawlinson is very fond of the water, and is dally "shooting" the breakers with his little surf board. Of late he has been assisting his father at the Coogee Beach dressing-sheds, and has found time for a swim everyday. He still retains traces of his summer browning, and is a fine, sturdy lad, and a powerful swimmer. Sydney, 21 June 1911, page 11. Honolulu, July 5, 1911, page 1. Out at Waikiki yesterday, Ted Cooper brought off a new surfing stunt, which had those who saw it guessing until they saw through the manouver. Finding the surf quiet, Cooper secured a tow line from the Heideman boys' launch, and giving them the signal to go at full speed, he jumped on his surf-board. The scheme worked well, for the speed of the launch kept the surf-board afloat and those who were round about witnessed the spectacle of a surf-rider flying across waters as calm as the proverbial mill pond. Number 288, 16 July 191, page 1. WITH the passing of the sea serpent as an habitual visitor at beach resorts has come the reign of the sea nymph. The change, as you may see with even half an eye, is distinctly for the better; since the sea serpent at her prettiest was altogether a terrifying object, while the sea nymph, on the other hand, presents a most attractive picture of athletic femininity. There are seasons for most everything, even here in California where summer rules 365 days in the year, and this is the season for aquatic sports. Tennis has had its day. Last week a yachting regatta at Long Beach attracts thousands of city dwellers to that locality. Motor boating also is growing constantly in popularity, and daily the beach IS thronged with bathers. Long Beach, Venice, Santa Monica and others of the cities built upon the strand have with-in their borders expert young women swimmers, able and willing to meet all comers, whether in an exhibition of fancy aquatic athletics, spectacular diving, swimming under water or in straightaway, races, be the distance a few rods or a few miles. Rivalry between the several cities is keen and in the past frequent water tourneys have been held, championships being awarded to the victors. No date has yet been set for the 1911 tourney, but that one will be held seems certain; while it also seems certain that a few records will be badly fractured, before the season closes. Recently surf riding has become a popular diversion for expert young women swimmers, ; and it is likely that a championship will be contested for this year, a championship awarded to the fair sea nymph who exhibits most grace and proficiency in this sport, long a popular feature of bathing in Hawaii, but only recently popularized here. Long Beach is the home of Helen Perkins, former of the Pacific coast women’s swimming title, and it is to this chic young woman that the “Queen City” looks to uphold its supremacy among the beaches. Though but 17 years old Miss Perkins, from constant practice in the water is an expert and when she cares to exert herself can give many a man swimmer a hard race. She not only excels in swimming but is also an accomplished diver and always entertains onlookers with her daring, grace and skill. Miss Perkins has said that she will never again enter a professional race; that she is through with the swimming game for good, yet it is hoped that she may again participate when the races now being arranged are held. Miss Perkins has twice defeated the Misses Sheffield of Ocean Park and they are naturally anxious for another opportunity to even up the score. This girl is not the only one, however, who is ready to uphold Long Beach against other beach resorts in the water. Mrs. Velma Johnson, Miss Elenor Blevins, Miss Zela See and a number of others are capable of giving good accounts of themselves against all comers, and that they will enter in the contest seems certain. Mrs. Johnson, while less expert and less speedy than Miss Perkins, is a plucky little woman in the water and is always trying. Miss Blevins is well known at both Long Beach and Ocean Park and that she will be in at the finish of every contest seems assured. She is a pupil of Marcus Lee, the Los Angeles high school lad who, for the past few years has swept every male swimming contest before him in Southern California, as well as at Berkeley, and his protege seems likely to do as well among women contestants. Like Miss Perkins, Miss Blevins is also skillful in other water athletics, particularly with the surf board. Miss See is an unknown quantity as far as actual races are concerned, yet she will undoubtedly give a good account of herself in the future. At the present time nothing; more definite than talk about the possibility of holding races between the young ladies mentioned has been done, yet there seems to be a likelihood of this talk turning into action within a short time. If Miss Perkins can be persuaded to reconsider her determination never again to race it is certain that the Sheffield sisters will consent to meet her. With these three entered the other three mentioned will probably; get in, too, and some rare swimming is sure to result. A keen sense of rivalry exists between the swimmers of the beaches of Southern California which a swimming meet such as the one spoken of would settle to a certain extent. Long Beach is extremely proud of its swimming girls and several of them are well known to visitors at that resort. It is no uncommon sight to see a crowd standing on the beach watching the young ladies they; dive through the waves, bobbing; up and down out beyond the breaker line or come riding swiftly toward the shore on surf board. Several of the young women mentioned have hitherto failed to enter swimming contests because of the fact that it is almost impossible for a woman wearing the customary bathing suit to swim rapidly or for any distance. Boys’ suits must be worn and the girl swimmers do not like to appear in public in such costumes. Los Angeles Herald, Number 288, 16 July 191, page 1. Honolulu, July 21, 1911, page 9. Copies of Jack London's new book, "Cruise of the Snark", are expected soon. I have written to the publishers thanking them for their kindness in granting us permission to reprint the chapters on "Surf Riding" and "A Trip to Haleaka." Honolulu, July 31, 1911, page 6. The local branch of the A. A. U. met in the office ot Lorrin Andrews on Saturday afternoon. The Hui Nala (sic, Nalu), an organization of Waiklki rowers and swimmers, composed chiefly of Hawalians, applied for membership and were duly admitted to the association. The new club intends to enter a swimming team for the aquatic events of August 12. Plans for the aquatic carnival were discussed and officials elected. Ira Canfield of the Outrigger Club will shortly offer a silver cup to be competed for by surf-boarding novices. Honolulu, August 1, 1911, page 9. Boys Will Compete in Aquatic Sports on August Twelfth. The (.lull will be a bard one to beat. ident mill captain of the teiun. T. I). Dude IjCiiiiiii nro star swimmers. paring for the (oinlug meet. tween 5 mid 6 o'clock. boat club members nro out revving nlsn. Honolulu, August 5, 1911, page 6. At a meeting of the Hui Nalu held last night twelve new members were elected, making a total of 27. The Hui Nalu have elected E. K. Miller, W. H. King and R. W. Foster as delegates to the A. A. U., and they will represent the club at all important meetings of the local branch of the A. A. U.
Honolulu, August 8, 1911, page 1. 50 yards Duke Kahanamoku, E.
Glbb, W. A, Cottrell, Dan Keawemahi, Major Keawemahl, Lukela Kauplko, Harold Hustace, Pat O'SullIvan, Hui Nalu; L. Cunha, F. Kruger, W. R. Myrtle . Hul Nalu; L. Cunha, F. Kruger, W. R. Grace, Healani; L. S. Davis, L. Per-) Myrtle . Duiavun,- lj, uinur, aiyrue. nian; Hul Nalu; A.
tyn'ey Hul Nalu; C. E. Maync, C.
C. Crozler, D. Center, Myrtle. 100 yards D. P. Kahanamoku, D.
Keowemahl, Hul Nalu; L. Cunha, D. Center, Kamakau, Myrtle. team unlnentoned, Hcalanl; B. Lyle,p. Bechert, Fergerson, Dickson, Orback, D. Center, L. Kerr, E.
Keowemahl, Hul Nalu; L. Cunha, O. Center, Kamakau, Myrtle. Plunge: Archie Robertson, H. P. Kehele, Hui Nalu; Tarlton, J. B. Lightfoot, A. Otremba, R. K. Fuller, Healani; Kamakau, L. Kerr, Myrtle. So far no Outrigger Club entries have been received, neither are there any unattached entries to hand. The entry book will remain open till 5 p. m. today at the store of the Hawaiian New Co.
Honolulu, August 9, 1911, page 6. That the newly formed Nui Nalu intend to play an important part in the aquatic events of Saturday next as shown by their list of entries, which comprise some of the best known natatorial experts in the Territory. The club was formed for the purpose of taking part in water sports on a bona flde amateur basis and with this in view afflliatton has been made with the local branch of the A. A. U. The club's membership Is made up chiefly of young men who swim and surf regularly at Waikiki, but who are not attached to the Outrigger Club. canoes at all local regattas where such events are on the program. Provided the Regatta Day committee put up trophies in lieu of cash prizes, as has been the rule in, the past, the Hul Nalu will enter four and six-paddle canoe crews. Archie Robertson is one of the club's live wires and he is greatly enthused over the Hui Nalu's chances of winning pointage honors at the coming carnival. "I expect that Vincent Genoves will win the half-mile swim. "The fifty and hundred-yards events should be won for our club by Duke Kahanamoku, whom I consider to be one of the fastest swimmers in the islands today. "The mile race looks to lie between Mayne of the Healanis and David Center of the Myrtles. "The fancy diving contest will be won by George Freeth, provided he obtains his A.U.U. ticket which he has been after. "I think that I have a fair chance of taking the plunge event myself, anyhow, I mean, to have a good try. "The four-forty yards will be a hard race. There are a very level lot of men entered and I won't attempt to pick the winner. "In the two-twenty-yards Cunha of the Healanis should just about beat D. Center of the Myrtles, but if he does so it will only be after a gruelling race. "The Hui Nalu should have no trouble in taking the relay." The Hui Nalu boys are practicing every day off the Moana Hotel over a course which has been laid out. Special pains will be taken to have the timing accurately done, and the times as recorded will furnish a reliable line on the standard of local swimming. There are a number of interesting developments to record in connection with the aquatic carnival to be held on Saturday afternoon next in the Bishop slip. Myrtles: L. Hough, A. Hough, K. M Smith, A. Myhre, 50, 220, 440 and 880 yards swim. W A Raseman , 50 and 100 yards swlm. K M Smith, A. Myhre fancy diving, obstacle race, plunge. Healanis: A. K. Tinker, plunge and 20 yds race. Relay race, L. Cunha, F. Kruger, W. Grace, R. Fuller, George Murray. J. P. Homan, A. E. Tinker, G. B. Bechert, C. B- Mavne, C. A. Broderick. Contrary to expectations the Outrlgger Club has failed to enter a team and report has it that the members got cold feet as soon as the entry list of the Hui Nalus was scanned. There is a proposition on foot to make the gladiatorial and obstacle races without any age limit as was at first suggested; also to accept post entries for the former event. The decision of the management in these matters will be announced later. It is reported that the Outrigger Club will be represented in the gladiatorial contest. It will be decided today whether George Freeth will be allowed to compete in the fancy dive or not. It appears he applied for registration with the A. A. U., but failed to answer two very important questions on the application form. One of these was when he last competed under the auspices of the A. A. U., and the other was if he had ever applied for A. A. U. registration before? These are two very important questions and Freeth is coming in from Watertown at the request of John Soper to answer them. Mr. Soper stated this morning that seventy-six local athletes have registered with the A. A. U., not Including the Kauai men. The water sports on Saturday will start at 2 p. m.
Seats and chairs will be arranged along Bishop's slip on Saturday for the convenience of the public. A small charge will be made for their use. Honolulu, August 10, 1911, page 6. People have been wondering why the Outrigger Club has not entered a swimming team for the aquatic carnival on Saturday. Swimming has been supposed to be one of the strong points of the Outriggers since the inception of the club, and their remarkable work in the big, little and middle-sized nalus has been given much space in the local prints. And the entry book has closed chock full of the names of the Healani, Myrtle and Hui Nalu boys, with not a single mention of the Outrigger Club except in the gladiatorial contest. The 'Rigger boys themselves are both disappointed and disgusted in the extreme of their woe will give a moonlight dance tomorrow night in their spacious lanai in order in some measure to forget their troubles. The Outriggers meant to enter a team all right, but were side-tracked and double-crossed at the last moment. E. Melanphy, the captain of the club, appointed Watson Ballentyne, a very fast swimmer, as captain of the Outrigger Club's swimming team, and he was instructed to go over to the Hawaiian News Company's store on Tuesday, the day when the entries closed, and put the names of the club's competitors on the book. The team included, among others Watson Ballentyne, Gibert Brown, R. K. Reidford, Elmer Evans and Marston Campbell, Jr. The Star came out on Tuesday with a list of the entries, and to the immense surprise of the Outrigger boys there was no mentlon of their swimming team therein. Instead, the name of Captain Watson Ballentyne appeared as entered by the Hui Nalus, a rival organization. Captain Melanphy was at once communicated with, and he phoned in hot haste to John Soper, who was receiving the entries. It was then 4:45 p.m., and entries were supposed to close at five o'clock. Melanphy told Soper that there had been a mistake over entering the Outrigger team, and asked that the club be entered blank in every event. Soper said that ho had no power to do this as the rules of the meet caIled for the names of intending contestants. If Melanphy could give him a llst of his team by five o'clock it would be all right, other wise the club would have to remain unentered. It was too late to prepare a list, so the matter had to go by default as far as me Outrigger Club is concerned. Gilbert Brown, a prominent member of the Outrigger Club, stated this morning that he was at a loss to explain Ballentyne's action in notentering his team. The fact that his name appeared with those of the Hui Nalu made it look, however, that the Outrigger Club had been treacherously thrown down. It is expected that a meeting of the members of the club will be calIed in the immediate future to deal with tne matter. Meanwhilef if you want to see a real mad man, just ask an Outriggerite if he thinks that his club has a chance in the coming contests. The management of the aquatic carnival were notified this morning that the affair could not take place in the Bishop slip, as has been arranged, owing to the act that the German ship Alexander Isenberg is unloading freight there. A wireless sent to Maston Campbell, who is on one of the other islands at present, asking for permission to hold the carnival in the Alakea slip. Word will probably be received from the superintendent of public works sometime today, and there is little doubt that the desired permission will be granted. While a longer course can be obtained in the Alakea slip, the wharves bordering therein do not possess as good accommodation for the sight-seeing public as is the case with the Bishop slip. The total registration with the local branch of the A. A. U. now amounts to 111. The last registration is that of George Freeth. The Outrigger Club will give a dance in their lanai at Waikiki tomorrow night. It will be in the nature of a "get together" affair. The Hui Nalu, which organization is at present giving more attention to swimming than dancing, will "get together" on Saturday afternoon at Bishop slip. Honolulu, August 11, 1911, page 3. SOCIAL NEWS OF THE DAY. Miss Edith Cowles made a very charming hostess yesterday when she entertained a surfing party and luncheon at the Outrigger Club at Waikiki. The girls met at this delightful clubhouse, donned bathing suits and spent the remainder of the forenoon in the briny blue, enjoying surf-board sports, canoeing and swimming. At half past one a delicious buffet luncheon was served at small tables arranged in one of the picturesque hau tree arbors in the grounds. The luncheon tables were dressed in scarlet geraniums and maidenhair. Covers were artistically arranged for fourteen. Those who enjoyed Miss Cowles' hospitality were Miss Lydia McStocker, Miss Julie McStocker, Miss Kathryn Stephens, Miss Alice Cooper, Miss Mary Schaefer, Miss Roberts, Miss Cordelia Walker, Mrs. Wilcox, Mrs. Clark, Mrs. Roy Francis Smith, Miss Kuteman, Miss Ethel Spaulding and Miss Ziegler. Honolulu, August 14, 1911, page 6. The club honors of the swimming meet held on Saturday afternoon in the Alakea slip were carried off by the Hui Nalu with a total of forty two points, the Healanis were runners-up with thirty-two points and the Myrtles managed to score five. It was a great triumph for Honolulu's latest aquatic organization and should result in the club's being put on a substantial and permanent basis. The star performer of the day was Duke Kahanamoku, who won the 50, 100 and 220-yards events. He broke two American amateur swimming records, covering the 50 yards in 24 1-5 seconds and the 100 yards in 55 2-5 seconds. He clipped 1 3-5 seconds off the old mark for the shorter distance and 4 3-5 seconds off the 100 yards record. Honolulu, August 15, 1911, page 3. Two American Amateur Swimming record were broken yesterday by Duke Kahanamoku the expert natatorial member of tha Hui Nalu Club. The fifty and one hundred yard records went by the board and the new figures established by Kahanamoku are respectively 24 1/5 seconds and 55 2/5 seconds. The old record for fifty yards was beaten by 1 3/5 seconds while the blue ribbon distance fljurtj were reduced by no less than 43 5 seconds. The course was carefully measured three times in all and tomorrow morning it will be measured again by a surveyor. Kahanamoku is a wonder and he would astonish the mainland aquatic sports if made a trip to the Coast. There were some great doings at the Alaksa slip yesterday when the first aquatic meet ever brought off under the auspices of the Amateur Union was staged. When a lad can got out and in a hundred yards dash beat the American amateur record by four and three fifths seconds there is something doing for sure. Duke Kahanamoku was known to be a fast sprinter but not many people thought that the youth was a world beater. No less than five watches caught Kahanamoku's time as flfty five and two fifths seconds for the hundred and there is no doubt that the record is correct. caught tho timo tho same that should be all right. The course was measured before the race and at least three times was the distance checked. A surveyor will again measure the straightaway tomorrow morning and then there can be no doubt about the records. The fifty yards race was also an eye opener and the way Duke got through the water was wonderful. He was pressed for the first part of the race by Cunha but when within twenty yards of the finish the Waikiki boy shot out and won easily enough in the amateur world record time of twenty four and one fifth seconds. Kahanamoku was cheered when he climbed out of the water and well he deserved the ovation. In the hundred yards sprint Kahanamoku set the pace from the report of the gun. He simply tore through the water and before half the distance was covered it was seen by those holding the watches that very fast time was being done. At fifty yards Duke showed clear of the rest of the bunch and he had a lead of icn feet over Cunha. At yards Duke was at his top and he was drawing away rapidly from Cunha. When within ten yards of the finish Kahanamoku sprinted at a wonderful rate and shot under the rope in record time. Cunha swam gamely and he can rest happy in the fact that he made just about his best time over the distance and lost to a coming world beater. Another great swimmer who did fine work over the longer courses was Vincent Genoves. He is a powerful swimmer and he endured three events 880 yards one mile and 440 yards races in the best style. Genoves swims a very even powerful double over arm stroke and he seems never to tire. In the half mile race Genoves ran away from his field and he won as he liked from Broderick. Genoves was over a lap ahead at the finish but there was a good race for second between Broderick and O. Crozier. The one mjle race attracted five starters and although Genoves soon took the lead Ginger Mayne kept going in steady fashion ana stuck to his guns well. He won by two laps almost and Mayne was second. The race for third place was a good one and Broderick just managed to get it from Center. D. Center did his best but Duke won by about thirty yards. George Freeth was the star performer in the fancy diving for his exhibition. He was closely pushed by B. K. Fuller who made 108 points in fine shape. In fact all the fancy divers were good and the work they did drew forth much applause from the spectators. olf into a comic stunt put up by a couple of boys wlro tried to knock one another out of boats with long sticks to which mops had been tied. The plunge for distance was keenly contested and B K Fuller won from A H Tarlton. The efforts of some of the heavyweights to keep going after the impetus gained at the start had died away were funny enough for anything. The Hawaiian band was in attendance and many popular tunes were played. Chairs were provided for a big crowd of people but there were many vacant seats to be seen. All the arrangements were satisfactory and the cool breeze mut mow made things very pleasant. Hui Nalu 42 Healani 32 and Myrtle 5. The new organization which is called the Hui Nalu made good in every respect and in Duke Kahanamoku and Vincent Genoves the club possesses two wonderful swimmers. Sydney, 15 August 1911, page 1.
l am willing to put up a trophy for a match between Tomy Walker or Reg Roberts (a schoolboy) against Mr. Williams." Honolulu, August 16, 1911, page 7. The aquatic meet pulled off under the auspices of the Hawaiian branch of the A.A. U. last Saturday was a success. Two world's records were broken at that time, and some other fast times were made. This goes to show that when Honoulu is given a real chance to tackle the mainland records of the A. A, U. the boys get pretty near them and even break it few. Now Duke Kahanamoku's fame will travel through almost all parts of the world for the great work he did in the sprint last Saturday. Duke is not well known among the people of Honolulu, but is remembered by many tourists who have visited Hawaii and taken a dip in the surf of Waikiki. Wailuku, Maui, August 19, 1911, page 6. Racy Paragraphs From the Capitol On Current Topics. I have read two or three excuses for the members of the Outrigger Club not entering the aquatic sports events which were pulled off here on Saturday. They were trivial and, if I am correctly informed, away from the real point. Nearly all of the entrants were members of the club and were members of the other sporty organizations, principally the Hui Nalu. Now, a theory is that the youngsters are not too much in love with Ford, the promoter of the Outrigger Club. The organization has been presided over so much by Ford and his satelites that the little fellows seem not to be satisfied. 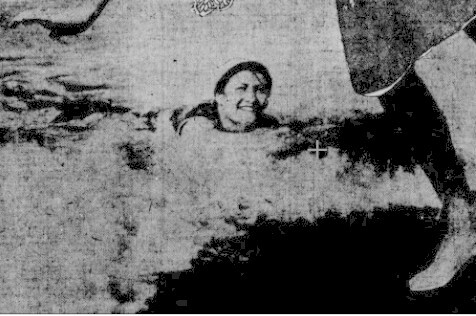 For instance : Duke Kahanamoku, who made a new amateur swimming record, happens to get his livelihood making surfboards and occassionally taking tourists canoing at so much a head. According to the ruling of Ford this bars him from competing for the Clark cups, or anything else under the auspices of the Outriggers. This ruling drove some other members from the Outriggers to kindred organizations. There is no reason why the club should not have had the honor of winning Saturday's events through the efforts of its members. Some day, perhaps, there will be enough men among the members of the club to outvote Ford, or the men he has drilled to vote as he tells them. At present, while an organization that should have the backing of the public, it is too much of a one-man-one-rule affair to suit the young men. Honolulu, August 22, 1911, page 7. Premier of New South Wales Tells Why He Was Out. With Premier McGowen was Mrs McGowen and J. W. Holliman, under secretary for finance and trade of New South Wales. The premier and his party was met outside the harbor and as soon as a landing was made a trip was taken to the aquarium, where an hour was spent, Mr Holliman declaring that it was a more wonderful sight than the aquarium at Naples which he recently inspected. From the aquarium the party went to the Outrigger Club where the surf board riders greatly interested all of the visitors and a number or snap shots were taken of the riders as they raced in to shore on the crest of the waves. Nalu have secured the use ot the "A,"
by the Kona paddlers last year. tho job of cox in good style. No. C; F. James, stroke. Freshmon V. Grace, bow; W.
crews now training for the Regatta races. possibly be loaned to the Hui Nalus. No. 5; Bob Thompson, stroke. )n tho,p Iiractco am, th(j gen.
boat in which to train for the race. George Clark, Myrtles; II. Lemke, J.
lng a substantial deficit to bo met. bo divided among tho three clubs. Number 339, 5 September 1911, page 1. Paul Rowan, well known business man and club member of Los Angeles, went through the Long surf to what seemed certain death and rescued an unknown man from drowning. Weakened by his fierce battle with the waves, Mr. Rowan was with the greatest difficulty able to keep afloat under the 100-pound burden of the man he sought to save. While hundreds looked on in helpless horror from the beach, Charles Allbright and A. J. Stout beat their way through the pounding breakers and with Hawallan surf-boards to sustain them, brought the imperiled men to safety. The unknown man had given up the struggle and sunk beneath the sea when Mr. Rowan reached him. The Los Angeles clubman, who is an expert swimmer, dived and brought him to the surface. But a high sea was running and the weight of his burden soon exhausted the swimmer. Before help came In the form of the surfboards, the brave rescuer and the all but unconscious rescued one were in the act of sinking for the third time. Back again in safety to the beach, Mr. Rowan made light of the matter and did not even wait to receive the thanks of the man he risked his life to save. At this dinner he was the guest of Colonel Drake of the Long Beach Bathhouse company. Had It not been for the prompt action of Mr. Rowan it is certain the unknown swimmer would have drowned. He had been In the surf for some time and had ventured out to a point where the water was ten feet In depth. Suddenly he threw up his arms and called for help. Mr. Rowan was well out to sea at a point beyond the exhausted swimmer and heard the cry faintly. No one else heard the appeal for help. Instantly Mr. Rowan turned and swam toward him. The clubman is a strong swimmer and covered the distance rapidly. He saw the ocean’s victim sink and dived to meet him when he rose. With the spasmodic clutch of the drowning, the man grabbed Mr. Rowan in a fierce embrace and they sank together. But Mr. Rowan fought himself free and struggled to the surface, bringing the other with him. No one was within hailing distance. Mr. Rowan’s strength was going fast when the plight of the two was seen by Allbright and Stout, who brought, the surfboard as rapidly as possible to the scene of peril. The final act of rescue was assisted in by John Leonard, life guard at the Hotel Virginia, who ran several blocks and plunged into the surf to aid in dragging the men ashore. Allbright is a Honolulu newspaper man and Stout is chauffeur for Dr. W. Lunderberg of Pittsburg. The two, who are fast friends, first met in Honolulu and surfboards brought by them from the Hawaiian islands enabled them to complete the rescue. The final act of the near sea tragedy was most spectacular. Allbright and Stout got their surfboards beneath the bodies of Mr. Rowan and the unknown man. Then, watching for favorable breakers, they coasted in upon the beach. The surfboards are made of beautifully grained wood of the Hawaiian islands and are six feet long. They are three Inches thick and eighteen inches wide and are suffclent to bear the weight of one man. Allbright and Stout are expert surf riders. Rowan was out bright and early yesterday, none the worse for his experience of which he makes light. He gives all praise to Stout and Allbright. The latter would not speak of their part in the affair, but from other sources it was learned that they had made similar rescues while in the Hawaiian Islands. Los Angeles Herald, Number 339, 5 September 1911, page 1. Number 341, 7 September 1911, page 12. MASTER LOUIS REID, 8 years old, traveled 2000 miles all alone and arrived from Honolulu In this city yesterday morning, and when he left the train a friend of the family, who met him, asked if he wasn’t hungry. “Yes,” answered the daring little tourist, “I am. For eight months they have been separated, Louis staying with friend.s in the army post of Fort Derussy, Waikiki Beach, Honolulu, while his mother was making them a home at 119 North Hollenbeck avenue in Belvidere, east of the city. Louis was the pride of the post and one of the features of the famous beach, for he can outride, outswim and outdance most grown men. He was one of the divers who are watched with interest by every visitor to Honolulu and his ability to handle a surf board on the great combers that break on this beach made him the envy of many a native Hawaiian. He came over on the liner Sierra, reaching San Francisco a week ago. There he met T. B. Dozier, jr., a young attorney, who became acquainted with the boy in Honolulu and was by him taught to use the surf board until he, too, became an expert. The telegram advised her that he would stay over in San Francisco until Tuesday and that he would take the Owl Tuesday night. Louis wore no tag and asked no assistance. He says he tipped the porters well, and his rule for getting along your way is to be generous with servants. Mrs. Reid, the mother, was formerly a Los Angeles girl, but has only been back here eight months, having been absent five years, first in Seattle and later for three years at the Hautree inn on Waikiki Beach, Honolulu. They will remain here now indefinitely. Los Angeles Herald, Number 341, 7 September 1911, page 12. Honolulu, September 9, 1911, page 13. One of lhe most attractive girls is Miss Wood who is sojourning with her patents at the Seaside Hotel. Miss Wood has been the motif for numerous entertainments since her arrival in Honolulu. Friday evening she enertalned a few friends at dinner, after the party went surflng by moonlight. Mile rovers were arranged for six. Duchess roses and smilar were the means of contributing beauty the artlstlcally arranged table. Among those present were: Mr, and Mrs. Wood, Miss Helen Spaldlng. Mr. Warren Timberlake and Mr. Francis Cooper. The Outrigger Club, at Waikiki, is gaining in popularity for society functions. Miss Mary von Holt will entertain fourteen of her friends this afternoon at a surfing party. The young people will met at half after three at the club house. After several hours devoted to aquatic sports, such as surf-riding, swimming and surf boarding, they will motor to the von Holt cottage, situated opposite Kapiolani Park, where a delicious supper will be served. Honolulu, September 9, 1911, page 4. Mrs. Ermentrude Kapakahi of the Blue Gate, Kakaako gave a surfing party off the Beach Road yesterday afternoon. A large ironing-board was used as a surf-board and all except a few of the fattest of the guests had great fun. An untoward incident some what marred the pleasure of the afternoon. Mrs. Lily Ona fell from the board and sank to the bottom. She was rescued through the gallant efforts of a tourist who prefers to remain incognito, and who fainted himself after he had towed the capsized lady to the shore. Mrs. Ona wns revived with repeated internal applications of "Palm Tree," a specific for cramps much in have never favor with the dwellers along the Kalla flats. In the swimming division Walter Pomeroy and McWood wll lprobably be matched with Duke Kahanamoku Jr., in a sprint, and with Vincent Genoves in a long or middle-distance event. tickets has already opened and J. V.
will probably take part, and a dance. over the full course on October 15. The Hui Nalu, winners of swimming and paddling laurels, are thinking of raising enough money to buy a barge with which to compete in next year's Regatta Day races. They intended putting a crew in the junior race this year but had to abandon the idea on account of being unable to secure the use of a boat to row in. The members of the club will make an effort to secure the use of the boat house of the defunct Kunalu Rowing Club for headquarters while training for next year's races. The club have ordered new swimming suits, their color being white with blue trimming and lettering. Archie Robertson stated this morning that an effort would be made to arrange swimming races between two members of the Hui Nalu and Messrs. W. R. McWood and Walter Pomeroy, the Olympic Club swimmers who are expected to visit Honolulu next month. Vincent Genoves would wear the blue and white in a long-dlstance race and Duke Kahanamoku would attend to any sprinting engagements. Pomeroy, who recently swam the Golden Gate, could take on Genoves in a 440 or 880-yard event. McWood, only a week ago, swam fifty yards at Redondo beach in 26 seconds flat, breaking the Coast record by a fifth of a second. Pomeroy finished second in an 880 yard race at Redondo beach won in 12.48 3-5. Honolulu, September 22, page 6. LONG BEACH September 4- For the first time in the history of southern California beaches two men were rescued from drowning here yesterday afternoon by Hawaiian surf boards. They were Paul Rowan a well known real estate man and a stranger whose name could not be learned. The stranger had swum out beyond the end of the safety line and not beeing a strong swimmer could not buck the heavy undertow. He began to sink and called out for help from Paul Rowan, who was swimming a few yards beyond him. Rowan seeing him go down hastily rushed to his side. The stranger grabbed him and crippled him by pinning his arms to his side. It was at this point that Allbright and Stout who were out beyond both the men lying in wait for a huge roller on which to coast ashore hurried to the rescue. Stout pulled the stranger onto his board and Allbright hauled Rowan onto his. Just then a roller came along and the experts from Hawaii holding the boards steady coasted through the breakers with the almost unconscious men. Rowan managed to get rid of the water he had swallowed and felt none the worse for his experienco but the pale and frightened stranger hurried away before his name could be learned. Allbright is a Honolulu newspaperman and Stout was formerly manager of the Seaside Hotel at Waikiki near Honolulu. They recently came to Long Beach with their koa wood surf boards and were entertaining a large crowd by on the beach by coasting in shore standing up when Rowan got into trouble. The surf boards are much larger than those used on this coast being six feet long, three inches thick and eighteen inches wide. It was their size which enabled the rescuers to place the drowning men on them for safety. Honolulu, September 22, 1911, pages 9 and 12. Long Beach Press: One of the most novel rescues ever pulled off in the surf at Long Beach was accomplished yesterday afternoon at four o'clock on the beach west of Magnolia avenue when Paul Rowan of Long Beach and a stranger who slipped away before his identity could be discovered, were saved from drowning by Charles Allbright and A. J. Stout. The two rescuers were also nearly exhausted and were helped to the beach during the latter part of their spectacular trip by the hotel life guard, John Leonard, who was unaware of the trouble until he saw the men struggling to reach shore against a strong rip tide. Allbright is a Honolulu newspaperman. Stout is chauffeuer for Dr. W. Lundenberger of Pittsburg. Both the rescuers met and became close friends in Honolulu and brought Hawaiian surf boards over with them recently to try them out in the local surf. Paul Rowan, who is a strong swimmer, was out beyond the end of the life lines which extend from the beach to a point beyond the breakers. He was swimming about, enjoying the exorcise when he heard a cry from a man who was nearer the shore, but just beyond the breakers. "For God's sake, help me. I have a wife on shore." gurgled the Stranger, a man of about thirty years of age; and he commenced to sink. Rowan went to his help with a swift overhand stroke and caught him just as he waa sinking a second time in the strong offshore current. he had to fight to free his arms. He talked to the man and told him to keep quiet and he would be all right, but the stranger had become thoroughly unnerved and hindered his own rescue. Rowan was also forced to swallow considerable sea water by the man's frantic efforts to hang onto him and he felt himself slipping. Allbright grabbed Rowan, who was dizzy from his forced immersion and placed him on his surf board. Stout did the same for the stranger. Just then a succession of big breakers came along and the two men, with their burdens, coasted magnificently inshore against the rip tide to a point where they could almost touch bottom. It was then that Leonard, who was on his way out to help, grabbed hold of the surf hoards and helped the men to finish their rescuing stunt. The stranger's wife was on the beach waiting for him and did not know what was the matter until the rescue was nearly completed and she profusoly thanked all four men for the rescue of her better half. The husband was too full of water for utterance and she hurried him away for stimulants. He was very pale and looked sick, but was able to walk. While he was unknown to the rest of the party it is believed that he lives in this city or Los Angeles. The peculiarity of the Hawaiian surf boards was to a large extent responsible for the effectiveness of the rescue of both the stranger and his first rescuer, Paul Rowan. The boards are made of the beautifully grained koa wood of the Hawaiian isles and are six feet long. They are three inches thick and eighteen inches wide. In coasting there is sufficient wood in one of them to almost bear the weight of one man, and in this instance they proved the salvatlon of two men. Both Allbrlght and Stout are expert surf board riders and for years coasted on the foaming breakers which run In on the beach between Diamond Head and Honolulu. There the breakers run mountains high at great speed for a distance of nearly half a mile. Big canoes with outriggers are also used to coast the breakers at that point in Hawaii and on coming to the mainland, both men brought their boards with them. Yesterday they were riding the breakers with the greatest ease in front of the Virginia amd a large crowd was watching them as they stood up on the boards and coasted rapidly ashore. The rescue yester dav was probably the first of the kind ever effected in a similar manner on the coast and the success of the men with their boards may result in the general use of the same type at this beach. Rowan was out bright and early this morning, none the worse for the salt water he was forced to inhale. "I don't mind drinking a little sea water when I want to," he said, "but I do object to having it forced down my throat whether I want it or not, and that was that the stranger was evidently trying to do with me." Both Allbright and Stout made light of the incident, and from information supplied from other sources it was learned that they made frequent rescues of a like nature out in the Hawaiian Islands, where Stout was manager for the Seaside Hotel at Waikiki. Honolulu, September 30, 1911, page 2. High Surf Running Off the Harbor. An unusually high surf has been running off the harbor and at Waikiki this morning. It is claimed by those who have observed the phemonema that the surf is higher today than at any time in the last nine years. Travel outside the harbor in the smaller launches proved somewhat a difficulty. At the bathing beaches a number of persons availed themselves of the rolling seas in riding the surf boards and canoes. ... Senor Igancio de Arena, the new Spanish Consul, paid an cordial call on the Governor this morning. Honolulu, October 3, 1911, page 3. Senor Igancio de Arena the newly arrived Spanish consul made a tour of the government and consular offices yesterday afternoon accompanied by A. de Bourni Uanuvurro consul general for the Republic of Portugal. Honolulu, October 21, 1911, page 3. The Outrigger Club is making elaborate prepartions for the carnival and dance to be held on November 4. Yesterday $600 was appropriated for permanent improvements to the club's premises, work on which will be started at once. J. R. Gait was appointed a committee of one to confer with the ladles who have expressed a willingness to assist on the evening in question, and Dr. Victor S. Clark has been placed on the house committee and will endeavor to instill some life into that lethargic body. Ted Melanphy, the club captain, will start worn at once preparing for the regatta of the youngsters and the Clark cup surfing contests, both of which events will be held on the afternoon of November 4. 2:45 o'clock Brothers canoe race. 3 o'clock Canoe against surfboardrace. 3:15 o'clock One paddle canoo race. 3:30 o'clock Three paddle race. 4:15 o'clock Six paddle race. 4:30 o'clock Girls' surfboard race. 4:45 o'clock Surfboard contest for Clark cup. 5 o'clock Small canoe surfing contest. There will also be a girls' canoe race. Judges: For races, D. Center, W. Soper, I. D. Canfield, D. Thayer, R. Reitow, K. Brown. Judges: For Clark cup contests, W. Ferris, A. R. Gurrey Jr., K. L. Brown. Timekeepers: G. H. Tuttle, Mr. TarIeton, V. L. Stevenson. Outrigger Club was. organized to train the youth of Hawaii to be at home in the surf. Sailing race, 2 p. m.
M. Magoon, F. Copper, F. Winter, M. Campbell, S. Carter, M. Tattle, K. Reidford. Board race, 2:30 p. m.
M. Campbell, F. Cooper, G. Brown, F. Winter, F. Garter, M. Tattle, Jeie Smith, M. Magoon, J. McKenzie, S. Carter, G. Tuttle, N. Tlmberlake. Brothers canoe race, 2:15 p. m.
Tuttle, Smith, Timberlake, Gray, Carter, McKenzie, Bush, Brown. Canoe and board race, 3 p. m.
Boys in canoes: Nelson Howell in Humphris's canoe, J. L. Dye in Castle's canoe, H. Johnson in Pond's canoe. Boys on boards: F. Cooper, F. Winter, G. Brown, M. Campbell, J. McKenzie, S. Carter, Tuttle. One-paddle canoe race, 3:15 p. m.
E. Evans, M. Campbell, F. Cooper, M. Tuttle, M. Magoon, M. Timberlake, F. Carter, F. Winter, S. Carter, K. Reidford, G. Brown. Three-paddle canoe race, 3:30 p. m.
H. Johnson, Ed. Davis, P. Timberlake; W. Abies, P. van Volkenburg, G. Wakefield; Fred Carter, L. A. Thurston, H. G. Winkley Jr.; Jere Smith, W. Harris, II. Smith; J. McKenzie, A. Taylor, M. McKenzle; F. Winter or E. Melanphy, F. Bush, A. Stacker; F. Richards n, G. Bromley, A. Higgins. Six-paddle canoe race, 4:15 p. m.
Sam Carter, G. Brown, L. A. Thurston, F. Richardson, N. Alexander, R. Sllva; F. Cooper, G. Ballentyne, Roy Graham, Fred Carter, R. Ginller, Ed. Davis; M. Campbell, A. Brown, G. Bromley, F. Winter, W. Abies, G. Wakefield; K. Reidford, W. Coles, H. Dennison, J. W. McKenzle, P. van Volkenburg, K. Emory; M. Magoon, G. Tuttle, P. Ovendon Y. Bush, Howard Johnson, A. Higgins; W. Tuttle, W.
Tlmberlake, D. Baldwin, A. Taylor, J. Smith, E. Cook. 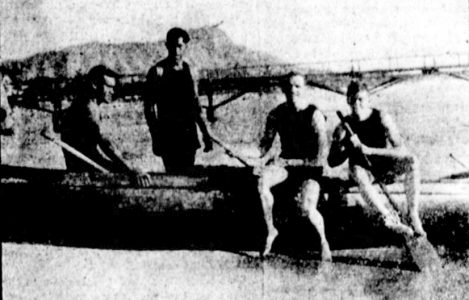 Substitutes for three and slx-paddle canoe races: Howard Smith, M. Melanphy, H. Burnett, Fuller Low, Ralph Gray, A. Putmann. 4:30 Surfboard contest for girls. 4:45 Surfboard contest for Clark cup. 5:00 Small canoe surfing contest. 5:30 Large canoe surfing contest. Sailing race: 1st, cup; 2nd, koa steering paddle; 3rd, spruce paddle. Board race: 1st pine board; 2nd, N. W. board, fancy; 3rd, plain board. Two-paddle, brothers: 1st, koa paddle; 2nd. spruce paddle; 3rd, N. W. paddle. Canoe and board race: 1st, spruce board; 2nd, pine board. One-paddle canoe race: 1st, cup; 2nd, koa paddle; 3rd, spruce paddle. Three-paddle canoe race: 1st, cup; 2nd, three spruce paddles; 3rd, three pine puddles. Six-paddle canoe race: 1st, cup; 2nd, cup; 3rd, paddles. A cup for the participant in the most events. A cup for the winner of the most events. A cup to the paddler in the largest number of winning canoes. E. Melanphy, D. Center, W. Ballentyne, G. II. Brown, A. H. Dondero, C.Gait, E. Magoon, W. Sopor, G. H. Tuttle, I. D. CanneM, A. H. Ford. This committee will take down sails and will have paddles ready, and after the six-paddle canoe race will take the Clark cup contestants out to the big surf with their boards. They will also tow out the small surfing canoes and will attend to anchors for the canoes. Judges: For races, D. Center, W. Soper, I. D. Canfleld, D. Thayer, R. Reitow, K. Brown; for Clark cup contests, W. Ferris, A. R. Gurrey Jr., K. L. Brown. Timekeepers: G. H. Tuttle, Mr. Tarleton, V. L. Stevenson. All races will start from the Outrigger Club's beach. Diamond Head of the first buoy. Canoes will start on the beach, the paddlers standing alongside them. At gunfire the crews will turn the canoes, get in, go over the course, and the first one back to the beach will be hailed the winner. The sailing race will be over the full mile course. The board race, for which the Canfield Cup will be presented, will be over a course two-thirds of a mile in length. The two-paddle canoe race will be to the first buoy and return. The canoe and board race will be to the Moana raft and return. The one-paddle canoe race will be to the first buoy and return. The three-paddle canoe race will be over the full mile course, so will the race for slx-paddle canoes. Honolulu, October 31, 1911, page 6.
to hell) out the big events of Saturday at Waikiki. Magoon will see that a motion picture machine and operater are sent down to the club to project the surfing motion pictures taken by Pathe Freres of Paris. These are the pictures that M. Bonvillian secured more than a year ago while in Hawaii. They were sent to Paris and developed there and a reel sent back to the Outrigger Club. The pictures show the junior members of the club on the grounds toying with their surf boards, the launching and the race on the boards out to the big surf, then the sport In the waves and the return to the club grounds before the big breakers. These pictures are now being exhibited in Paris and the Frenchmen take much delight in the sport. The members of the Outrigger Club will see how the Hawaiian grass houses look to the European. Edmund Melanphy is closing up his entries for the big regatta for the youngsters on Saturday afternoon. Honolulu, November 4, 1911, page 3. Everything is in readiness for the regatta, chowder and dance to be given by the Outrigger Club at its grounds this afternoon, and a very large crowd is looked for. Besides the Clark and Canfield cups which will be contested for this afternoon, cups have been presented by E. O. Hall & Son and F. J. Green, a new member of the club, who has put up two cups for the youngsters to race for. The grounds have been very prettily decorated for the occasion and they will be this eveninig beautifully illuminated. The chowder, which will be served between the hours of five and eight, will be under the direction of Mrs. W. A. Wall and Mrs. Fuller. Dancing will start at eight o'clock and the music will be furnished by Ernest Kaai's Glee Club. During the sports in the afternoon the Hawaiian band will give a concert. Board Race Course, Moana pier to stake off Seaside and return. Prizes: First cup, second, surf board; third, ticket for the evening entertainment. Prizes: First, 6 N. W. paddles; second, six tickets for the evening entertainment. Prizes: First, cup; second, tickets for evenlng. This race may have to be run in heats for the reason that there are only six available small canoes. Prizes: First, two spruce paddles; second, two N. W. paddles; third, tickets for the entertainment. Prizes: first, three spruce paddles; second, three N. W. paddles; third, tickets for the entertainment. Prizes: First, cup: second, spruce paddle; third, one N. W. paddle; fourth, ticket for the entertainment. Honolulu, November 6, 1911, page 3. The Outrigger Club did itself proud on Saturday, hundreds of towns people journeying out to the pleasant quarters of the club to enjoy the regatta and chowder, and the dance which followed. The afternoon was a good one for surf sports and the weather just cool enough to be comfortable. Surfboard race: Malcolm Tuttle, Elbert Tuttle, Frank Winter. Six-paddle canoe race: Marston Campbell, Jr.s', crew, Sam Carter's crew. Brothers two-paddle canoe race: Carter brothers, McKenzie brothers, Tuttle brothers. Two-paddle canoe race: Marston Campbell, Jr., and Herry Denison, Tuttle and Harris, McKenzie and Smith. Three-paddle canoe race: Marston Campbell, Jr.. Denison and Ovend.-n, Malcolm Tuttle and Carter brothers, McKenzie, Johnson and Smith. One-paddle canoe race: Sam Carter, Marston Campbell, Jr., William Harris, Malcolm Tuttle. Small boys' race: Carter, Wakefield and Dyer; McKenzie, Cook and Burnett; Winter, Timberlake and Crane. Judges: A. H. Tarleton, D. S. Thayer, G. H. Tuttle; starters, David Center. Ed F. Melanphy; recorder, W. F. Soper. The chowder was just as good as chowder can be, and the dance one of the most enjoyable functions ever held at Waiklkl. The success of the affair is largely due to the indefatigable efforts of Alexander Hume Ford, one of the club's liveliest members and staunchest supporters. There is a splendid surf at Waikiki beach today and many are taking advantnge of the waves in the lagoon to indulge in surf sports. Honolulu, November 13, 1911, page 3. There was no fishing in the lagoon or outside the reef yesterday, the big surf preventlng angling operations. Honolulu, November 11, 1911, page 9. Bealt Wright and Maurice McLaughlin, who with W. A. Larned contstitute the American tennis team that is en route to New Zealand to challenge the Australians for the Davis Cup, are both men who have wide experience in all forms of sport. On their arrival in Honolulu on the liner Zealandia Wednesday last they voted for surfing as the afternoon's entertainment, and when they came ashore at Waikiki after several fast shoots and an upset, they voted surf-riding the best sport they had ever tried. The left-hand picture shows McLaughlin (left) and Wright, as they stepped off the liner. In the other picture Wright (left) and McLaughlin are shown ready to take a chance with the breakers. Friday 1 December 1911, page 12. The North Steyne Club has forwarded for confirmation to the Surf Bather's Association a programme for the club's annual carnival. Fifteen life-saving clubs will be represented, and an exhibition of surf-shooting by Mr. L. Bouffett, of Norfolk Island will be given. - Noted in S&G Champion: Drowning, Bathing and Life Saving (2000) page 159. Mr L. Bouffett was probably a decendant of John Buffett who arrived on Pitcairn Island in December, 1823 on the British whaler, Cyrus. The Pitcairn islanders, largely decenced from Bounty mutineers and Tahitian women, were renowned surfriders. See Ramsay: Pitcairn Island (1821). Sydney, 20 December 1911, page 5. JOTTINGS FROM THE SURF BEACHES. A southerly breeze on Sunday wan responsible for wry big breakers at Bondl, and a powerful undertow was encountered for almost the full length of the beach. Bathers did not venture far out, and a strict watch was kept bv members of tho two local life-avlng clubs. About 12 o'clock .the alarm was given that a man was being swept out to sea. .case of rescues may not bo out of place here. Steyno carnival on December 30.
in tho nudo from public view Is disgraceful. being given to this matter. was the advice tendered to "tho councils by! Mt.' Griffith (Minister for Works). woman who had got into dlfflcultles. bers at -Davis's Coffee Palace on Monday ! senior and junior teams will face the starter. ceived from Mr. S. Jackson. fort from the great beat. to be held about the middle of Janutrry. Rescue arid "Resuscitation Competition:' B. A. L:\r.gan, L. Stephenson, C. Brownhlll. Alarm Reel llaco: B. Grieve, J. Warren, A.
, tho Royal Llfc-Savlng Society. tlie current season. '' . .
Geoff Cater (2010-2016) : Newspapers:1911. Surfboard Riding at Honolulu, Queenbeyan NSW. Russell J. Wilson Surfs Waikiki, San Francisco. Ivy Schilling Rescues Tommy Walker, Manly. Hawaiian troupe of Board Shooters, Manly. Fred Notting's Surf Canoe at Lifesaving Carnival, Freshwater. Surf-shooting Exhibition by Norfolk Islander, North Steyne.